After the Consumer Electronics Show binge in Las Vegas last week, the guilt and remorse settle in — kind of like the day after Thanksgiving. Was it too big? Too flashy? Why did we collectively gorge on stuff that we don’t really need? Shouldn’t we reflect more upon the slave labor that makes these toys for us, rather than on the superficial novelty they provide? (The cartoon above, and Flip The Media’s excellent Your Phone Was Probably Made in a Sweatshop expose this harsh reality). There is a hole in my heart dug deep by advertising and envy and a desire to see a thing that is new and different and beautiful. A place within me that is empty, and that I want to fill up. The hole makes me think electronics can help. And of course, they can. They make the world easier and more enjoyable. They boost productivity and provide entertainment and information and sometimes even status. At least for a while. At least until they are obsolete. At least until they are garbage. 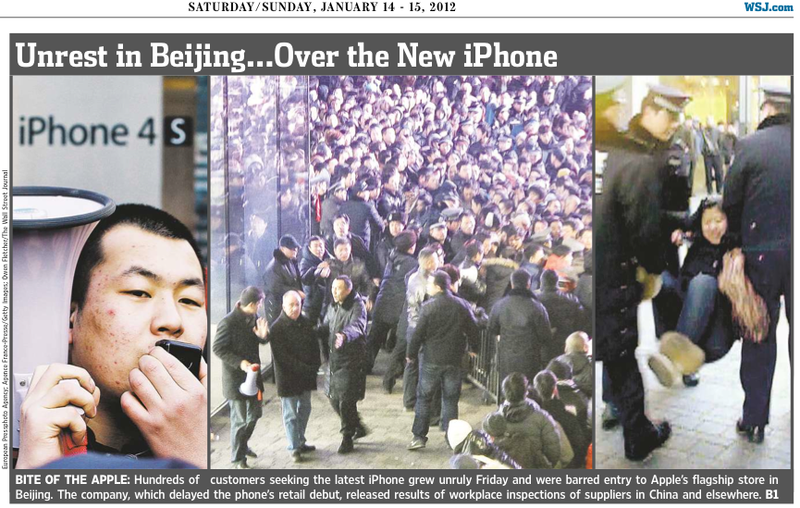 And I couldn’t avert my eyes from the Wall Street Journal’s above-the-fold front-page headline trumpeting the much-anticipated Chinese uprising, but then throwing in the twist: not due to politics, but because of the newly-released iPhone 4s. Fine. It’s all true. And all many of the tech blog post-mortems have concluded that this year’s show as more evolutionary than revolutionary. However, as I consider what I saw — from fridges, to cars, to TV’s — it’s pretty clear what’s driving this consumer electronics gold rush (this year’s CES after all, had the most attendees and the most exhibits): mobile and social. Of course, this is so intuitively obvious, and may have been for a couple of years with the notable explosion in adoption of devices such as Apple’s iPhone (mobile) and platforms such as Facebook (social). It’s that synergy, convergence, whatever, that I refer to in the latest chapter to Storyteller Uprising, Inconspicuous, Ubiquitous and Sociable. For those of us who have smartphones and are connected to online social platforms, we know how useful and convenient these digital technologies can be. They’re also fun. 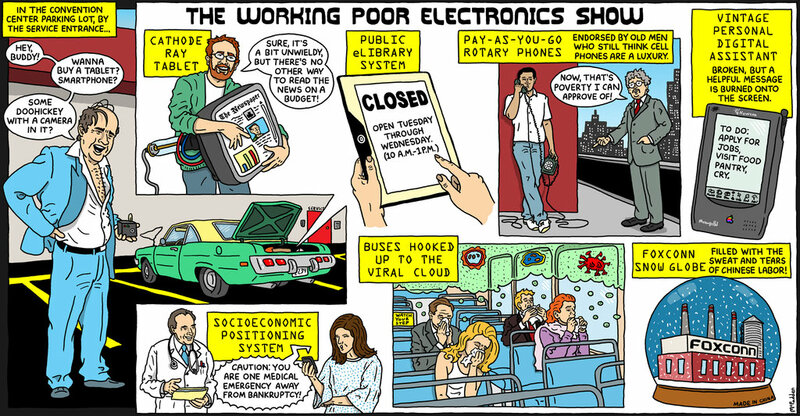 But recognize the bigger picture here: we have those powerful, relatively inexpensive, connective devices with us nearly all the time. And they’re usually on. It’s all about the consumerization of tech. We’re moving “beyond the PC” as The Economist recently put it, and this will have a far-reaching impact. The enterprise (Blackberry, Windows) once drove tech usage and innovation. Now, how we use our mobile devices begins outside the office. The “Digital Hollywood” and “Three Screens and Beyond” panels I attended at CES helped drive this realization home. IBM’s Scott Burnett (Director, Global Consumer Electronics Industry) pointed out that this device and platform convergence and convenience is not just about entertainment and the connected screen. Rather, there’s application in safety and security, energy management, health and wellbeing. I saw this first hand when I checked out the in-vehicle technology exhibits. The key? We can integrate the functionality, connectivity, CPU power and portability of our smartphone outside of our living rooms and office into our vehicles, kitchens and fitness routines. It’s a new reality that has yet to truly manifest itself, but as it does, 2017 may be as foreign to 2012 as 1976 was to 1776. We are just only beginning to experience this massive, ridiculously fast-moving transformation. I’m convinced it will change pretty much everything, including the relatively molasses-like world of higher education. Former FCC Chairman (and Colin’s son) Michael Powell said as much during his inspiring Higher EdTech keynote at CES. So we can question CES’ relevance as we pronounce that the devices at CES individually may not be particularly revolutionary. But frankly, the big picture trend that I glimpsed in Las Vegas is absolutely a show-stopper. I’m now trying to find a way to get to Mobile World Congress in Barcelona next month to continue my headline event intelligence-gathering in this pivotal year.